The figure below illustrates this potential problem. It shows the Fed's upper and lower bounds on the federal funds, the effective federal funds rate, and the 4-week treasury bill interest rate. 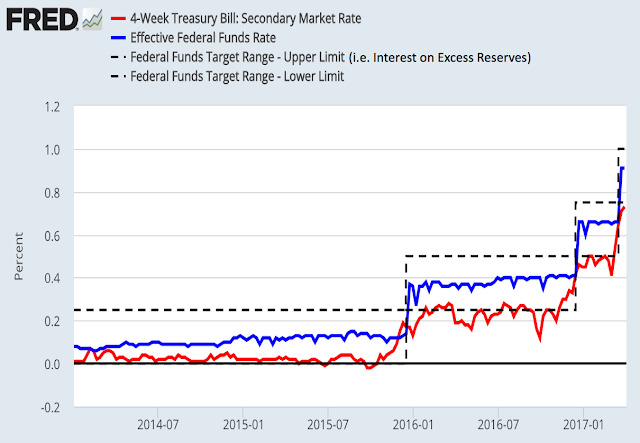 These upper and lower bounds have created a successful corridor system for the federal funds rate, but they have not been very good at bounding the 4-week treasury bill yield. Moreover, the spread between the IOER--the upper bound--and the 4-week treasury bill has persistently been sizable and gotten larger on average since the first interest rate hike in December 2015. It is hard to see why banks would want to swap their excess reserves for treasury bills given this spread. This is just one of the challenges the Fed faces in shrinking its balance sheet. Read the rest of the piece for the others I outline. P.S. While it is easy to understand why the effective federal fund rates falls within the corridor, it is not clear why the 4-week treasury bill interest rate has not conformed to it. Arbitrage should push them closer together, so there must be some friction. One obvious one is the limited access to the Fed's balance sheet. Even with RRP, there are still only so many firms that can effectively tap into the Fed's balance sheet. I suspect that if the Fed further opened up its balance sheet some of this spread would disappear. Whether that is a desirable objective, however, is an altogether different question (though it is discussed in this weeks Macro Musings podcast). Perhaps tax benefits of Treasury investments are to blame for the spread? "This latter task may prove to be especially daunting since it puts the Fed in unchartered waters."--Beckworth. Well, maybe the Fed needs to charter a boat to enter uncharted waters. Or buy its own boat, if the waters are unchartered. I've been confused about the Fed's chosen path since Dec 2015 (the first increase in IOR). Why not start letting the balance sheet gradually shrink instead? Reverse QE so to speak. They'd still be buying all the time as the amount of T-bill maturities and MBS amortization would exceed the likely desired balance sheet runoff. Frankly, I find it crazy (and it should be criminal) for the Fed to pay a higher rate for overnight money than the Treasury has to pay. IOR is now close the the rate on 1-year Treasuries. It's crony capitalism as only a select group can get this rate paid to them. And what will they do when the bill for paying IOR exceeds the interest they are earning on their portfolio?